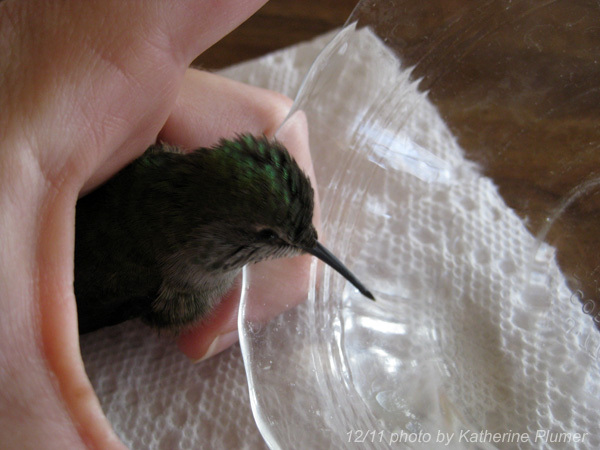 This morning, my mom found a hummingbird that was somehow stuck to the hummingbird feeder. I never quite figured out how that happened, but nevertheless, it was stuck. 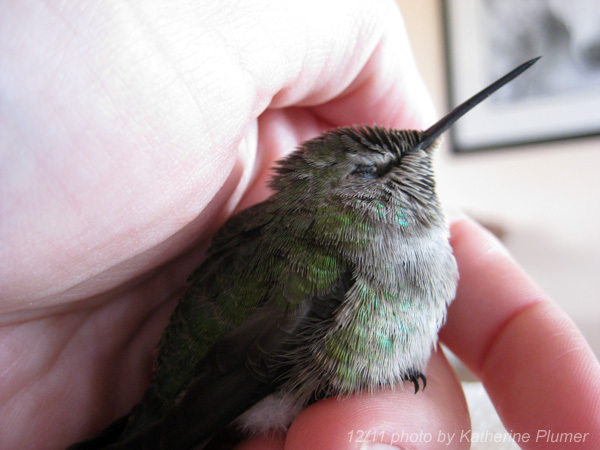 The bird, a female Anna's Hummingbird, was in pretty sad shape. Who knows how long she'd been hanging there. She was fluffed up mostly kept her eyes closed... very weak. 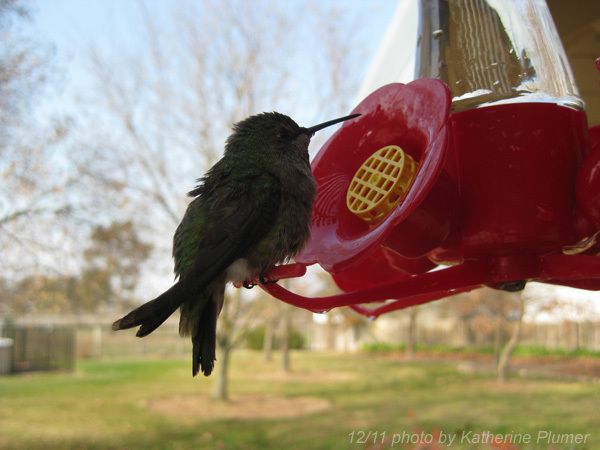 I knew she needed to get some food if she was going to recover, I remember learning that hummingbirds expend so much energy flying that they have to eat often, so I mixed up a little bowl of hummingbird food. It didn't take her long to figure out where the good stuff was, and she eagerly drank and drank and drank. 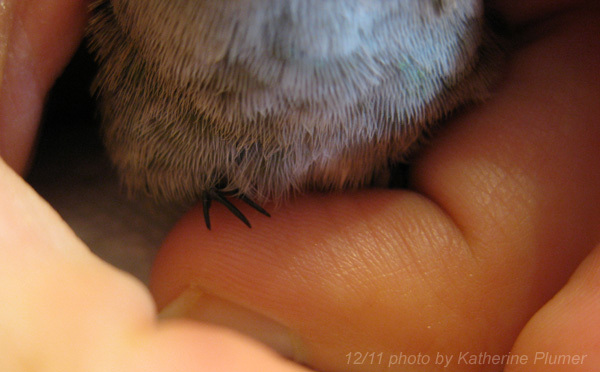 I sat with her perched in my hand for well over an hour as she warmed up and refueled. 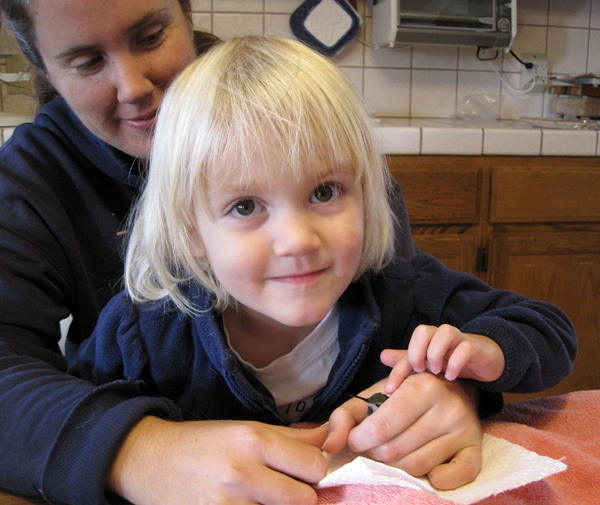 My niece Chloe came over for a visit and was pretty enthralled with the little bird. 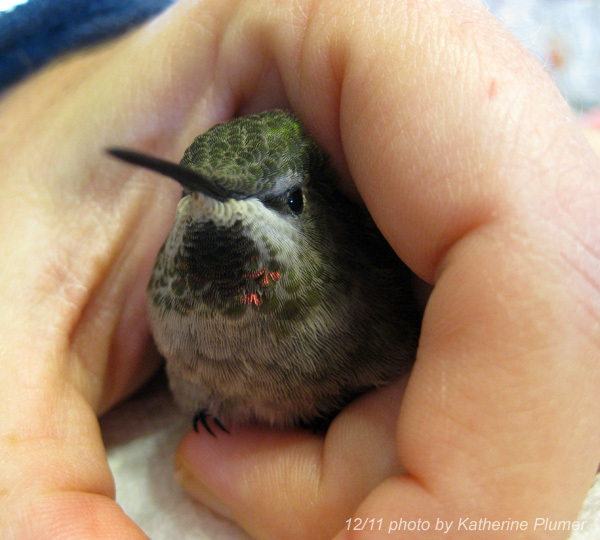 We named her "Princess Hummingbird" and she was very gentle about petting the little bird. Once the bird was bright-eyed, awake, looking around, and starting to move her wings around while sitting in my hands, I decided it was time to put her outside. I carefully placed her on the perch of the hummingbird feeder. She sat there for a bit, drinking more, and then buzzed away out into the yard. That was a unique Christmas gift both to you and to the little hummingbird. 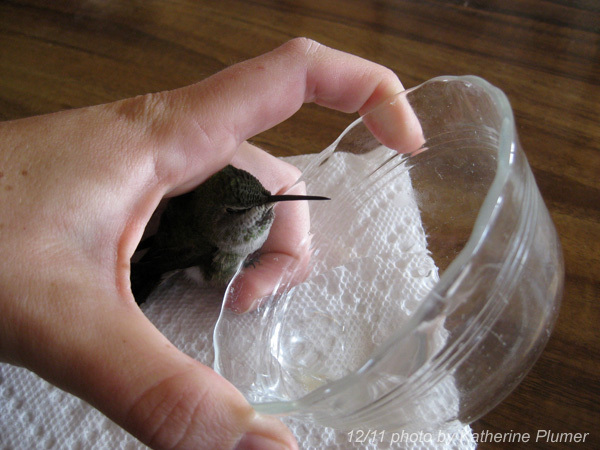 The rehabbers at Wildlife Care used to tell tales of how smart hummingbirds are, that they'd figure out someone was trying to help them and just go with it rather than spazz out. I'm always glad when you do something like this because you take such good pictures and we all get to be part of it. Brigid, I don't know how she was stuck, I didn't find her. Probably had not been there overnight but maybe since early morning? How awesome and wonderful all at once! I love these dear little birds - I was so glad to read about the happy ending :-). There is something magical about them. How neat that you got to hold one and nurse it back to health!